It's nearly February and mid-winter break is poised for another sneak attack on the schedules of local parents. Do you have a plan? This modern school year counterpart to spring break typically centers around the Presidents Day holiday — Monday, Feb. 19 this year. Days off school vary by school district. Some take the entire week following Presidents day off; some take the Thursday and Friday off beforehand, plus the holiday Monday. If you need to send the kids somewhere, here's a sampling of camps happening in the Puget Sound area. Camp dates vary and align with nearby school districts' break dates but check carefully to make sure the camp you're considering matches the days you need. Dates: Feb. 19–22, 9:30 a.m.– 12:30 p.m. or 1:30–4:30 p.m. This year's theme is amazing ancient beasts! 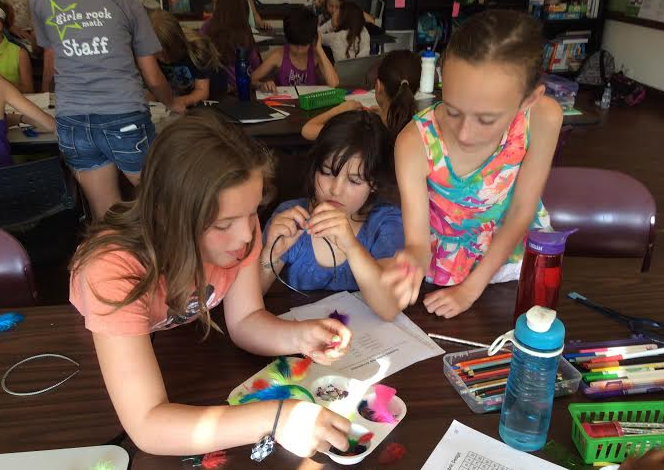 Campers discover a range of prehistoric animals and use them to inform their own artistic creations. Winter is great time to work on soccer skills at local indoor arenas or in Seattle's Woodland Park. Campers work on technical skills and practice them in scrimmages. Older campers will also study the tactics of the game. Dates: Feb. 19–23, 9 a.m.–3 p.m.; free extended care available until 5 p.m.
Design a robotic hand, develop a musical instrument and more. Campers get busy with awesome engineering projects during this camp. A sampling of activities at this super-active camp includes Dodge ball, soccer, the ultra-popular Inflatable Fun Zone, Capture the Flag and much more. If you’re exhausted just thinking about it, that’s the point. Note: Ages 3–5 may only enroll in half-day sessions, morning or afternoon. Dates: Feb. 29–23, 8 a.m.–6 p.m. This camp packs in lots of activity with games, crafts, plenty of gym time and swimming for ages 7 and up. Select needed days or enroll for the whole week. Campers delve into drama topics such as comedy or themed weeks such as Magic Treehouse. Activities include acting, improv, musical theater, scene study and more. Each camp session culminates in a performance showcase for families. Dates: Feb. 20–23, 10 a.m.–3 p.m. Explore cartooning as an art form with a local professional cartoonist and illustrator, including character development, action poses, perspective and lettering. All supplies provided. Swimming is Samena's specialty and kids never tire of pool time there. Campers will also enjoy dry land activities, like sports, games and arts and crafts. This camps offers single day enrollment which can help families needing a flexible schedule. Note: Children who are age 5 must be in kindergarten to attend. Dates: Feb. 15–16 and 19–20, 9:30 a.m.–4 p.m.
Mid-winter Break Camp at the "J" takes campers on adventures modeled (roughly) after popular TV shows such as "The Amazing Race" and "America's Got Talent." The J offers day-by-day enrollment for flexibility. Dates: Feb. 19–23, 8:30 a.m.–3:30 p.m. Learn strategies to survive the wilds of winter in the outdoors. Campers in different age groups study the survival of flora and fauna that inhabit the fascinating Mercer Slough. Hands On offers playful school break camps on topics that kids will enjoy delving into. Mix and match STEAM-themed morning and afternoon camps; lunchtime and afternoon extended care available for campers in grades 1–4. Dates: Feb. 20–23, 9 a.m.–4 p.m.
Campers dig into STEAM-inspired projects and arts and crafts-focused projects in this fun camp that includes in a couple of field trips. Auburn Parks offers additional mid-winter break camps for different ages groups on different themes. Dates: Feb. 20–23, 1–4 p.m. Junior ennui can be quickly addressed at My Gym’s active, half-day camp. Just deliver your youngsters for three hours of tumbling, climbing, games, circle time, stories and art projects. It's not too early to start thinking summer camps. Come to one of ParentMap's regional Camp Fairs for oodles of terrific camp ideas that you can explore all under one roof, for free! Editor's note: This article was originally published in 2015 and updated for 2018.